Harriet Taylor Mill (née Hardy; London, 8 October 1807 – Avignon, 3 November 1858) was a British philosopher and women's rights advocate. Her extant corpus of writing can be found in The Complete Works of Harriet Taylor Mill. She is largely remembered for her influence upon her second husband, John Stuart Mill, one of the pre-eminent thinkers of the 19th century. Taylor was attracted to Mill, who treated her as an intellectual equal and collaborated with her on many of the texts published under his name. Mill was impressed with Taylor, asking her to read and comment on the latest book he was working on. The two became close friends. In 1833 she lived in a separate residence from her husband, keeping her daughter with her while John Taylor raised the two older boys. John Taylor agreed to Harriet's friendship with Mill in exchange for the "external formality" of her residing "as his wife in his house". Over the next few years Harriet Taylor and John Stuart Mill exchanged essays on issues such as marriage and women's rights. The surviving essays reveal that Taylor held more radical views than Mill on these matters. Taylor was attracted to the socialist philosophy promoted by Robert Owen in books such as The Formation of Character (1813) and A New View of Society (1814). In her essays Taylor especially criticised the degrading effect of women's economic dependence upon men. After John Taylor died in 1849, Taylor and Mill waited two years before marrying in 1851. Taylor was hesitant to create greater scandal than the pair already had. Mill's marriage proposal is a model of equality. She wrote a number of essays, including several on domestic violence and The Enfranchisement of Women, published in 1851. Many of her arguments in this piece would be developed in J. S. Mill's The Subjection of Women, published eleven years after her death, although The Subjection is much more conservative than Taylor's Enfranchisement. Except for a few articles in the Unitarian journal Monthly Repository, Taylor published little of her own work during her lifetime. She did, however, read and comment on all the material produced by John Stuart Mill. In his autobiography, Mill claimed Harriet as the joint author of most of the books and articles published under his name. He added, "when two persons have their thoughts and speculations completely in common it is of little consequence, in respect of the question of originality, which of them holds the pen." Together, they wrote "Early Essays on Marriage and Divorce", published in 1832. The debate about the nature and extent of her collaboration is ongoing. A letter written by Mill in 1854 suggests Taylor was reluctant to be described as joint author of Mill's books and articles; "I shall never be satisfied unless you allow our best book, the book which is to come, to have our two names on the title page. It ought to be so with everything I publish, for the better half of it all is yours". The reasons for her reluctance may include the likely response to a philosophical text published by Mill only or as a coauthored work. J. S. Mill called her a valuable contributor to much of his work, especially On Liberty, which he later dedicated to her when it was published in 1859, a year after her death. 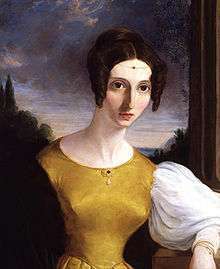 Harriet Taylor Mill died in the Hotel d'Europe in Avignon, France, on 3 November 1858 after developing severe lung congestion, possibly due to syphilis. Her daughter Helen Taylor, who would become a well-known feminist, completed the writing of The Subjection of Women with Mill. ↑ Right Again – The passions of John Stuart Mill by Adam Gopnik , The New Yorker, 6 October 2008. 1 2 3 Tong, Rosemarie (2009). Feminist Thought: A More Comprehensive Introduction. Westview Press (Perseus Books). p. 17. ISBN 978-0-8133-4375-4. ↑ "Being about, if I am so happy as to obtain her consent, to enter into the marriage relation with the only woman I have ever known, with whom I would have entered into that state; & the whole character of the marriage relation as constituted by law being such as both she and I entirely & conscientiously disapprove, for this amongst other reasons, that it confers upon one of the parties to the contract, legal power & control over the person, property, & freedom of action of the other party, independent of her own wishes and will; I, having no means of legally divesting myself of these odious powers ( as I most assuredly would do if an engagement to that effect could be made legally binding on me) feel it my duty to put on record a formal protest against the existing law of marriage, in so far as conferring such powers; and a solemn promise never in any case or under any circumstances to use them. And in the event of marriage between Mrs. Taylor and me I declare it to be my will and intention, & the condition of the engagement between us, that she retains in all respects whatever the same absolute freedom of action, & freedom of disposal of herself and of all that does or may at any time belong to her, as if no such marriage had taken place; and I absolutely disclaim & repudiate all pretension to have acquired any rights whatever by virtue of such marriage. 6th March 1851	J.S.Mill",The Voice of Harriet Taylor Mill, page 166-167. ↑ The Complete Works of Harriet Taylor Mill Chapter 4. ↑ Mill, Mrs. John Stuart (1851). The Enfranchisement of Women (July 1851 ed.). London: Westminster & Foreign Quarterly Review. p. 27. Retrieved 4 June 2014. ↑ "Harriet Taylor". BBC History, Historic Figures. BBC. ↑ Mill, John Stuart (1873). Autobiography (1873 first ed.). London: Longmans, Green, Reader & Dyer. pp. 251–252. ↑ Jacobs, Jo Ellen. The Voice of Harriet Taylor Mill. Bloomington: Indiana UP, 2002, p. 135-. ↑ Mill, John Stuart (1859). On Liberty (1859 first ed.). London: John W. Parker. p. 6. Catalogue of Harriet Taylor Mill's correspondence and other papers at the Archives Division of the London School of Economics.